Check all your door gap clearances with one tool. Made of Aluminum, anodized and laser etched, will last a lifetime. Easy to use, small, fits in your shirt pocket. 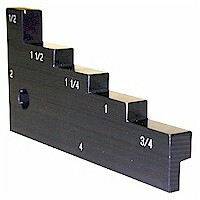 3/8", 1/2, 3/4", 1", 1-1/4", 1-1/2", 2" and 4"